The woman throws up her arms apparently in despair. The next panel begins with the narrator's text. Narrator: Top secret website design. A diagram is seen with two circles. The first circle contains the text: Affordable Air Website. The second circle contains a circular logo bearing the phrase: NEARLY SECRET AIR. 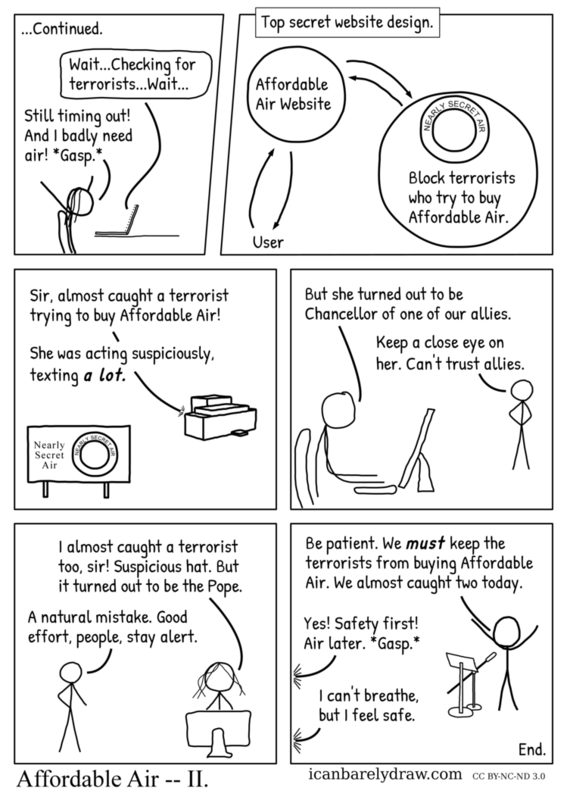 The second circle also contains the text: Block terrorists who try to buy Affordable Air. An arrow goes from the first circle to the second circle. Another arrow goes from the second circle to the first circle. The word "User" is placed outside the circles. An arrow goes from this word to the first circle. Another arrow goes from the first circle to the same word. The next panel shows the exterior of a building in the distance. Closer, a vertical sign is seen standing on two posts. The sign contains the text: Nearly Secret Air. The sign also contains the same circular logo seen in the previous panel, bearing the same phrase: NEARLY SECRET AIR. Voice 1 from building: Sir, almost caught a terrorist trying to buy Affordable Air! Voice 1 from building: She was acting suspiciously, texting a lot. The next panel shows a first man seated at a keyboard and video monitor. A second man stands in the background with his hands on his hips. First man: But she turned out to be Chancellor of one of our allies. Second man: Keep a close eye on her. Can't trust allies. The next panel shows a wavy-haired woman facing the reader and seated behind a video monitor. The same second man from the previous panel stands in the background with one hand on his hip and the other angled away from him. Woman: I almost caught a terrorist too, sir! Suspicious hat. But it turned out to be the Pope. Man: A natural mistake. Good effort, people, stay alert. The next and final panel shows another man standing near a lectern and microphone. He gesticulates with his arms spread out and up. Man: Be patient. We must keep the terrorists from buying Affordable Air. We almost caught two today. Off-panel voice 2: I can't breathe, but I feel safe. Title: Affordable Air -- II. Can’t help feeling that this is some kind of commentary on the US government.